Students will be able to produce and expand sentences to share their appreciation for the earth. Display the globe or photographs of the EarthAnd ask students to describe what they see. Tell students that today is a special day, it is called “Earth Day” and it is a day to celebrate the earth. Remind the students that we all live on a planet called earth and must take care of our planet to keep it healthy for all people. Read aloud the book The Earth and I By Frank Asch. As you read, pause to note the different things the earth does for the child in the story (e.g., listens). Explain that students will now choose one of the things the earth provides and will get to draw a picture and write a SentenceAbout that thing. Remind students that a sentence must begin with an uppercase letter and end with punctuation such as a period or exclamation point. Encourage students to sound out words and use invented spelling in their sentences. They can also refer to the list on the board generated in the previous portion of the lesson. Pass out The Earth Gives Me worksheets to each student. 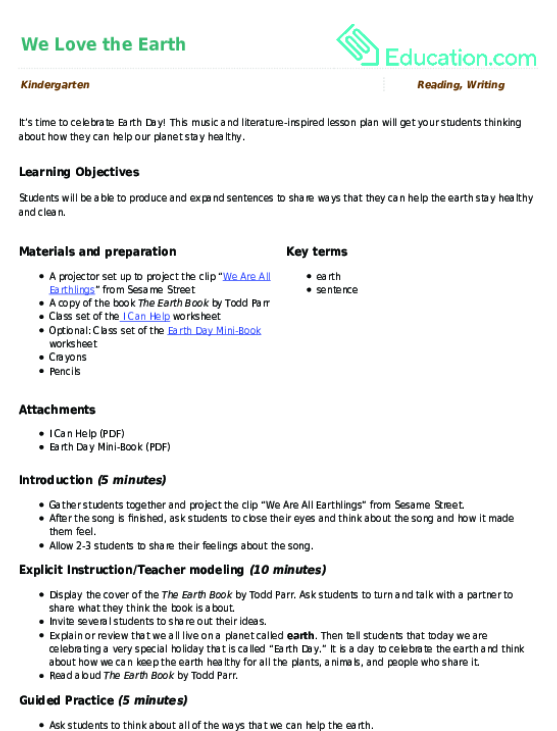 Provide students with a copy of the Earth Day Circle worksheet to complete. Gather together students who need additional support to work in a small group. Use shared writing strategies to write 1-2 sentences as a group to complete the worksheet. 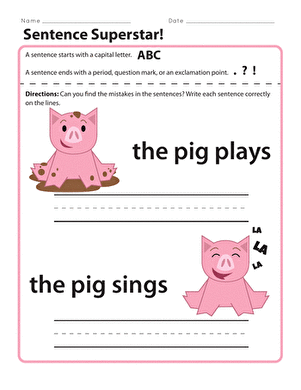 Collect student work samples and assess whether students were able to write a complete sentence that began with an uppercase letter and ended with proper end punctuation. Invite several students (as time allows) to share their sentences with the class. Display student work in a public place (such as outside the classroom) to share with school community. End the lesson by asking students to think about how they can share their appreciation for all that the earth does with their family and friends. 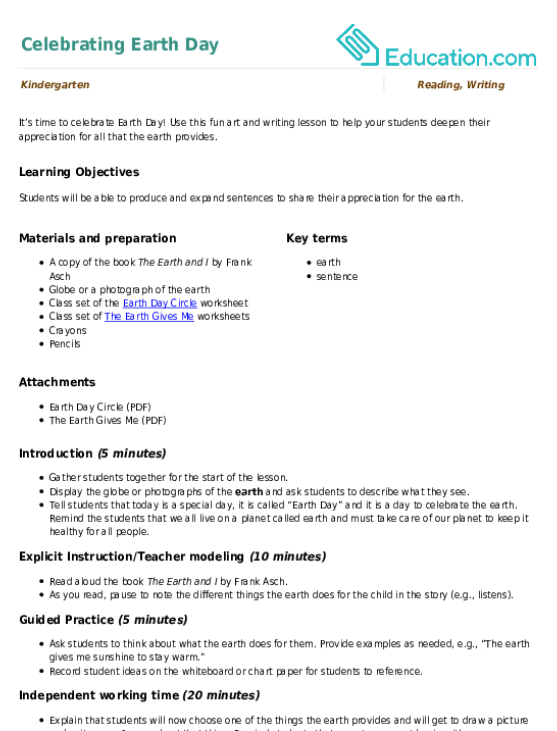 Use this worksheet to help them think about how they can help the earth as they celebrate Earth Day!